Previous Post Coucou. C’est moi. Thanks for the Chicago food update! Food trucks have hit Paris, too. But they have not evolved beyond burgers yet. I recall my parents just recently ate a Belly Shack and had great things to say. Thanks for reading. And hope to see you soon. Looks and sounds great Jess and love the art work! Dining in Chicago has taken a toll now with fusion this, black angus burger that; a trend pops up and everyone follows suit. Even the fine dining has been a real bloated experience lately especially now that Charlie Trotter closed his world famed restaurant. The latest casualties are food trucks and cupcakes everywhere. Thankfully there’s still Rosded, however I’ve figured out most of their dishes, and a place called Belly Shack which successfully melds Korean and Puerto Rican cuisine. Although I’m sure nothing beats the Paris markets! 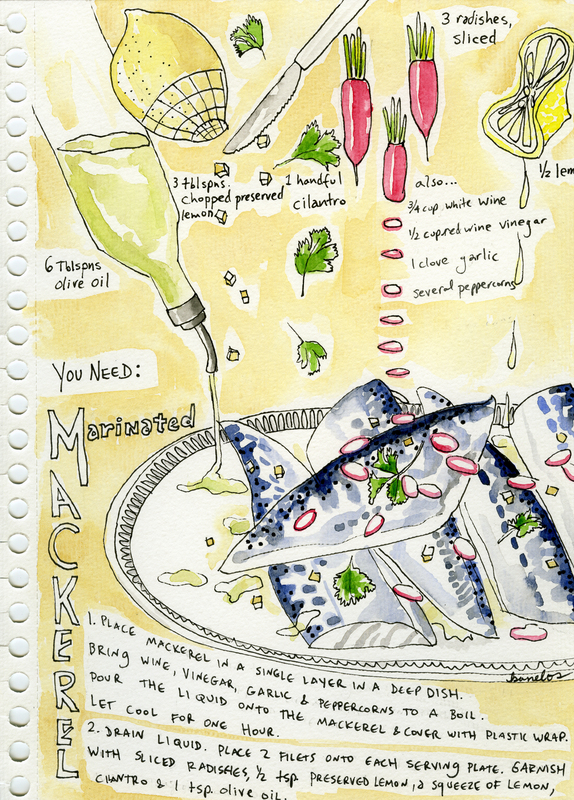 Mackerel is super-healthy & cheap, too. What’s in your grandma’s recipe? I’m awfully curious. I love it! This is a lot like Maine Mackerel, which was apparently something my grandma hated whenever her mom made it for her growing up…I found the recipe sometime last year, though, and it blew my MIND. I can’t get enough of it! As always, gorgeous illustration. What kind of pen do you use? Thanks for reading! Let me know if the mackerel is as delicious as it looks.